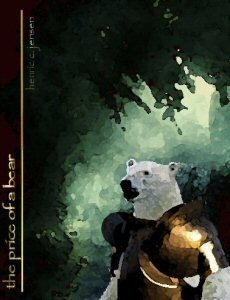 When Yonatan of Riverfield rescues an armored bear from the hands of the Picts, he doesn’t realize his compassion will lead him through forests and mysterious caves into adventures a storyteller like him only spins tales about. The bear teaches him things he didn’t think he would ever need to know, introduces him to species he didn’t know exist and gives him a true friend. When Marhren Khromork sneaks out of her home in the middle of the night, in defiance of Tradition, she has no idea that she is walking right into an adulthood that has ramifications far beyond herself and that when she returns her world will either be changed forever or have ceased to exist. We both awoke just before dawn the next morning, roused by the sound of someone or something rummaging through our belongings. There was no moon, so without a torch or a full fire it was impossible to see anything but the shadowy outlines of something small and hairy moving next to my pack of trade goods. I heard the roar when Valdemar threw himself across the small space, landing with a clank and a huff almost on top of whatever it was that was helping itself to the contents of my pack. By the time I had hauled out my tinderbox and lit a tree branch wrapped in long dry grass the sounds had changed from huff and puffs and high-pitched shrieks to serious swearing in two keys. I thrust the makeshift torch in the direction of the commotion and swearing, and what I saw will be with me forever. The huge white Bear was standing on his hind legs, trying to free himself from a tiny furry creature that was grabbing on to his neck and had taken a fierce hold of his ears and obviously refused to let go, no matter what the Big Bear did. “Do not just stand there, help me!” Valdemar yelled. He was throwing himself from side to side, grabbing at the creature that had pinned itself to his head and neck. Each time his giant paws came close he would be rewarded with a quick but obviously painful nip from the tiny creature’s even tinier mouth, resulting in gargantuan howls from the Bear. It was quite comical. I rushed in, and got a firm hold of the creature’s long tail which it had coiled around Valdemar’s neck for extra grip. After several minutes during which both I and Valdemar bloodied our fingers and paws further on the creature’s sharp teeth, Valdemar managed to get a hold of its scruffy neck and pulled it off his head. Hanging 10 feet above ground from the Bear’s big front paw, it sputtered, hissed and trashed, obviously very upset. “Let me go, you evils!” it shrieked. I do not think I had expected it to speak at all, let alone hear it speak in a human tongue. I was intrigued. Valdemar on the other hand did not seem at all surprised to hear the small creature speak. He growled in response, the creature shrieked and fell silent as well as quite still in his grip. “Hold it there, let me tie it up”, I said and turned towards my pack for some leather strips. “I want to keep it,” I responded. “It speaks, it can obviously think and I want to know more about this creature.” Having found the leather strips I returned to the Bear and the creature which seemed to be about half my size. “I can tell you everything about it!” Valdemar growled. “It is a Wolie. They are pests. Thieves and murderers! Yes, they can speak human tongue, but they are still thieves and murderers!” He shook the Wolie, glaring at it. He was rewarded with a big glob of spit and a shrieking sputter. “I still want to keep it! I said. “OK, you want to keep it, but right now I am the one in possession of it, so what do you give me in trade for it?” the Bear looked at me, obviously serious. “You want me barter you for it?” I looked at the Bear, incredulous. He nodded. “You…” I had no words. “I will give you half the contents of my pouch for it! Now, please hold it so I can tie it up.” The Bear erupted in a belly laugh that made the walls around us bulge out from the shock wave. He had been putting me on! Oh the deviousness of…I wished all the Dragons of Hel on him and joined him laughing. She walked all of the remainder of the day, and didn’t stop until she was within earshot of Farmers’ Meadow and could hear the Night Bell toll. As she came around a bend in the tunnels, approaching a side tunnels where she imagined that she could spend the night, she saw several Council Constables moving about ahead. They weren’t moving to or from the Meadow. They seemed to be moving about waiting for something or someone chattering amongst themselves. Suddenly they all stiffened, snapping to attention at the sound of steps approaching. Four figures appeared from a side tunnel. The Council Elders from Craftsmen’s Cavern and the Elder President of the Six Caverns! Marhren shrank back against the rock wall, hoping that the shadow of the bend would conceal her. “What are they doing here and after the Night Bell and all?” She asked herself in a muted whisper, inching forward, trying to hear what they were saying. “Has the Khromork Renegade been seen yet?” The Elder President spoke in a loud and haughty voice. The three Craftsmen’s Councilors stood to the side, looking as if they’d rather bee home eating the evening meal. “No Your Eminence.” one Constable said, “our informant said that she left the Convocation around Midmorning, so she should be approaching the Meadow at any time now.” He shuffled his feet. “Well, you’ll just have to wait here for her then, apprehend her and bring her to me as soon as you do. We simply cannot have youngsters trudging about on Unsanctioned Journeys defying Tradition. We have been too lenient with this sort of thing. It has to stop. I want an example to be made!” The Elder President spun around and walked back the way he had come. The three Craftsmen’s Councilors hurried to follow. The Constables stared after them and resumed their aimless marching back and forth across the tunnel. Marhren sat back on her hunches, her tail twitching, her stomach in a knot and churning. Elder President Mardhukr was looking for her very specifically! She wondered why. He could have decided to ‘make an example of’ anyone, so why her? She couldn’t think of any reason she would have drawn his attention in this manner. Her frantic thoughts were interrupted by a draft of wind from the side tunnel she was almost sitting in and she heard the soft shuffle of feet over rock. “Pst!” A hand gripped her shoulder. She swung round ready to defend herself. She saw the vague outline of a small Khurzon. “Come with me!” The figure moved further into the tunnel. “Come on!” the voice hissed when she didn’t follow right away. She gathered herself and stepped quickly over to the small figure. A torch was lit further up the tunnel, and Marhren could see several other Khurzons, ragtag clothes and matted furs waving for her and the young Khurzon to hurry. As soon as they reached them, the group set off at a brisk trot, torches, tattered cloaks and hoods billowing, flapping and whisking around them. “What is happening? Who are you” Marhren asked no one in particular, nevertheless very confused and angry.